Discours amoureux is a psycho-acoustic essay, a consciously digital ambient album between laptop electronica and field recordings. Mental strolls – geographic and historical, musical and philosophical – are combined with the real strolls through the green spheres of the summery, loud city on the search for security, calm, a chance to exhale. The impressions are immediately tonally processed and reflected. The result is new, unexpected interpretations, spaces and cross-connections – unexpressed stories, lucid moments, heard and unheard elements. All pieces were created in summer 2016 and mostly recorded in laptop live-performance mode straight onto another "recorder" computer. Poetic, tender, but also crashing, Paul Wirkus gruffly re-announces his presence with resigned enthusiasm with a new minimal electronica album. 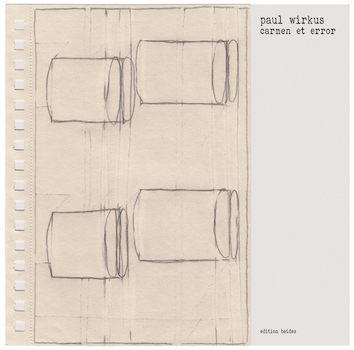 Paul Wirkus is a Polish born electronic avant garde composer whose first released work came out in 1999. He released two albums in 2016, breaking a 7 year silence, one of which was Discours Amoureux. It is a concise, 34 minute work with 4 tracks, each 7-11 minutes in length. Their titles are four digit numbers of unspecified meaning. Opener "1982" begins with what I would call "digital gibberish", a circular undulation of mangled metallic noise and glitch, with subtle warps and pieces missing. It's the sort of sound that would typically be generated by an error, some kind of degradation of signal. Z'EV often employs such sounds. Over the course of 11 minutes, the texture loses its coldness, swelling into a luminescent, ambient space, eventually becoming a shimmering, tuneful drone that could be sourced from guitar. The 2nd piece "1499" is a short melodic fragment of synthesizer filtered into warm nectar, pleasantly contrasted with the rough, organic timbres of coins being dropped on a wooden table and rusty metallic objects being struck. It's a marvellous use of field recording. The 2nd half of the piece drops off into a desolate sparsitude analog delays and eerie granulated pianos, the notes elongated into sickly smears. "2016" is an immediately inviting chordal swell, a nebula infused with unearthly glow, sketching a beautiful dramatic anticipation, a nocturnal romance. Again, I hear metal objects being struck, and the rhythm of these contacts strikes me as ritualistic and intentional. The sound of footsteps creates the sensation of movement from place to place. We follow the holder of this handheld device, Paul himself. A public place is nearby, a thick, sweaty shroud of bustling murmurs and conversation hangs over, adults and children. To be the lone observer, hanging on the periphery of this, is a haunting sensation. The final piece, "1888", has a fitting cinematic finality, another resonating chord that holds, and quivers, poignantly luminous. Paul Wirkus is a German musician based in Cologne who works with electronics and percussion. We heard him performing on Adikia with Ekkehard Ehlers, with whom he regularly works, but I’m surprised we haven’t noted any of his solo works before, as he is exceptionally good. The record Discours Amoureux (EDITION BEIDES 2) is something I can wholeheartedly recommend to anyone who wants to hear genuinely expressive and considered experimentation in the field of digital / electronic music, an area which is over-populated with too many half-baked ideas. The clarity of Paul Wirkus’s ideas, and the conviction with which they are executed, shine forth exceptionally well on this release. Although you could easily pigeon-hole this sound into “laptop” or “ambient” music, the record transcends these labels. Wirkus himself describes Discours Amoureux as a “psycho-acoustic essay”...he intends the music to represent imaginary walks he takes in his mind, and combines the sounds of these walks with actual field recordings captured in the city [of Cologne], while on a search for inner piece or mental calm. It seems significant that he did it in the summer; perhaps the sunlight itself contributed to the sense of well-being that permeates this music. From a technical point of view, he executed the work mostly through live playback from one computer onto another computer dedicated to recording; I get the sense that he’s not one of those obsessed with infinite tinkering of sound files, layers, and edits, a pass-time which it is possible to be drawn into when you embark on the path of laptop composition. There’s a certain warmth and spontaneity which has transferred directly into the digits; but I am assuming that this is the result of much preparation, thinking, and compositional rigour. Other journalists and music organs have long recognised the genius of Wirkus, and he’s not ashamed of the many prizes and “CD of the month” awards that have come his way. His catalogue can be found on labels such as Staubgold, Gusstaff Records and Quecksilber, and the earliest one I can find suggests his recording career began in 1999. This is the second release on Edition Beides, and follows his Carmen Et Error also released in 2016. Recently Wirkus has been expanding his act into multi-media projects, including radio plays, music for dance, and theatre. 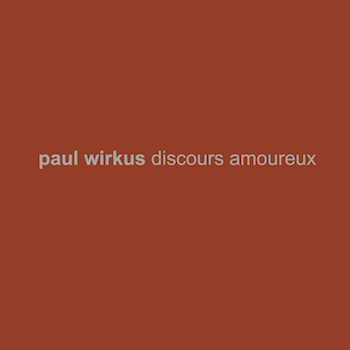 A lot of musicians try this sort of thing, but one listen to Discours Amoureux should persuade you that Wirkus has a strong grasp of narrative and structure, and is skilled enough to express this very clearly in his work. Very good. From 14 November 2016. The music of Paul Wirkus is organic, instinctive and has a very private character; it is raw and poetic simultaneously. The album Carmen et Error arose in performing mode; the body and the memory play a significant role in the process. Every second one feels the executing hand of the author, who is constantly present and alive. Wirkus is clearly a reflecting minimalist with a tendency towards fragile perfectionism. Stylistically, the music varies between the extremely sparingly instrumented, intimate solo percussion pieces, the remarkable, notional minimalistic rock power-trio and an acoustic Delta Blues by Mississippi Fred McDowell. Wirkus plays all instruments himself and sings. Part of the album concept of Carmen et Error is comprised of pencil drawings, which are just as important to the artist as the music itself. Musiker, die multidisziplinär und gegenübergreifend agieren, stellen diese eher seltene Fähigkeit in der Regel auf verschiedenen Tonträgern zur Schau, jeder einzelne schön einem anderen Genre gewidmet. Der Kölner Komponist und Multiinstrumentalist PAUL WIRKUS macht genau das auf seinem Album CARMEN ET ERROR (Edition Beides) nicht. Wirkus, der ein beachtliches Solowerk seit den späten 1990ern veröffentlicht hat und auch mit Stefan Schneider (To Rococo Rot) im Projekt Mapstation und mit Ekkehard Ehlers gearbeitet hat, stellt minimalistische Percussionstücke, ausgefranste (Punk-) Rock-Songs und drei Coverversionen des Country-Blues-Musikers Mississippi Fred McDowell nebeneinander - keine Blues-Dekonstruktionen, wie man meinen könnte, sondern originalgetreue Interpretationen. Immer schön abwechselnd. Dieses Spiel mit der Heterogenität auf dem immer wieder mit Forderungen nach Homogenität belästigtem Medium Langspielplatte ist die eigentliche künstlerische Botschaft von CARMEN ET ERROR, es ist eine Art „Greatest Hits“-Album mit Songs, die niemals Hits werden. Co powiecie na bluesa z Delty Mississippi, tyle że w wykonaniu Paula Wirkusa. Na co dzień Wirkus mieszka i pracuje w Kolonii, ale jak pamiętamy, pochodzi ze Słupska. To tam w latach 80. zasilał szeregi punkowej grupy Karcer, a następnie w Niemczech założył zespół Spokój. Z kolei pod koniec lat 90. współtworzył wraz z Marcinem Dymiterem duet Mapa. Później przyszedł czas na solową działalność, oscylującą na pograniczu minimalistycznej elektroniki i muzyki współczesnej. Współpracował również między innymi z Ekkehardem Ehlersem, co też zaowocowało świetną płytą „Ballads” (Staubgold, 2009). Paula Wirkusa zaliczam do grona tych artystów, którzy powracają z nową muzyką kiedy chcą i nie patrzą na panujące trendy. Najnowszy jego album „Carmen et Error” (02.09.2016 | Edition Beides) to w zasadzie minimalizm utrzymany na różnych poziomach stylistycznych. Z jednej strony mamy bardzo oszczędne eksperymenty przy użyciu instrumentów perkusyjnych, gongów, dzwonków i awangardowego rocka (np. „A Constant”), a z drugiej – wspomniany akustyczny blues wywodzący się z Delty Mississippi (zinterpretował utwory Mississippi Freda McDowella). Przyznam, że się nie spodziewałem po Wirkusie bluesowego wcielenia. A tu proszę, sprawdził się znakomicie w roli wokalisty i gitarzysty.